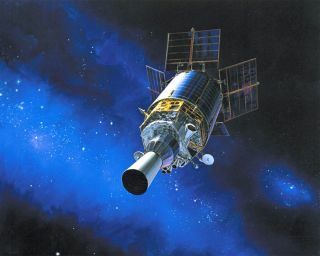 Artist rendering of a Defense Support Program satellite in orbit. U.S. military observers can have trouble identifying satellites whizzing overheard in Earth's crowded space lanes. A new Pentagon effort aims to find the unique visual signatures of individual satellites for quick identification, regardless of whether such satellites belong to friend or foe. The Defense Advanced Research Projects Agency hopes such signatures — remotely seen from ground or space sensors — could even help identify different satellites made by the same manufacturer. But it's not easy. Satellites' orbits may often change between overhead passes, and it's getting more difficult to spot individual satellites in a space becoming more crowded with vehicles, satellites and pieces of leftover space junk. The DARPA solicitation for an innovative solution from small business, issued April 27, noted, "Some objects are frequently lost, and sometimes serendipitously reacquired without recognition of its previous catalog existence, unless manpower-intensive analysis intervenes." Any effort to reliably track "active payloads and tumbling objects" and the like would focus on finding each satellite's physical or "operational" signatures (perhaps signals or movements unique to a certain satellite). Timeliness and speed would be crucial for helping military observers quickly identify satellites that had gone missing and possibly reappeared. The technology needed here likely would involve some sort of software algorithms that can do automated identification based on satellite signatures. Once such software is created, DARPA envisions passing the testing along to the Joint Space Operations Center, the U.S. military's center for coordinating space forces and directing space power to support global operations. DARPA's focus on satellites also includes the recently launched "SeeMe" effort to deploy dozens of cheap satellites that can provide overhead battlefield surveillance for the U.S. military. The Pentagon afency also has the ongoing "Phoenix" project to try to cannibalize dead satellites and use the parts for new "Frankenstein" satellites. Follow InnovationNewsDaily on Twitter News_Innovation, or on Facebook.